Watchman receive a similar fate. It is disappointing and frankly shameful to see our noble industry parade and celebrate this as “Harper Lee’s New Novel.” This is pure exploitation of both literary fans and a beloved American classic (which we hope has not been irrevocably tainted). We therefore encourage you to view Go Set a Watchman with intellectual curiosity and careful consideration; a rough beginning for a classic, but only that. OK, first off, I hate to complain about small independent bookstores — there are far too few of them operating in the United States these days, and they all deserve our support and patronage. On the other hand … C’mon, there was ample — in fact, more than enough — press coverage of the fact that Go Set a Watchman is neither a sequel nor a prequel to To Kill a Mockingbird. Unless Americans were burying their heads in the sand, they should have known what they were purchasing. Caveat emptor! Certainly Brilliant Books had to know the history of Watchman. It’s ridiculous for the owner to now be whining that he was somehow deceived, that he didn’t know exactly what he would be offering in Watchman: that it was Lee’s first stab at writing a novel, and that her editor asked her to start over and create what would become the classic To Kill a Mockingbird. Furthermore, I enjoyed Go Set a Watchman — very much. 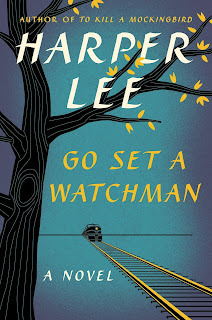 Yes, it’s a quieter, slower and less plot-focused read than Mockingbird; had Watchman preceded Harper Lee’s rewritten novel to publication, there’s every chance Lee would have disappeared into obscurity long ago. Nonetheless, Watchman offers a comfortable, chatty, often poetic and distinctly Southern writing voice that will be very familiar to Mockingbird fans, and a story that should appeal to people wishing to revisit the earlier novel’s Maycomb, Alabama, setting 20 years later. If you understand that Lee penned Watchman before Mockingbird, and that she did so at a time when her father, Amasa Coleman Lee — on whom she modeled lawyer Atticus Finch — still hewed to what were then the Deep South’s dominant segregationist beliefs (A.C. Lee subsequently changed his tune), you ought to have no problem understanding why the Atticus on display in Watchman isn’t the same one you know and love from Mockingbird. I hope that when Watchman goes into its later printings, and when people have forgotten all of the background we’ve recently been provided by the media, this book’s publisher will see fit to add a prologue to Lee’s new/old novel, explaining how Watchman came to be — and came to be published so late in its author’s life. That context is important. Meanwhile, people who aren’t willing to give Go Set a Watchman a chance, and who would prefer to return their copies when they realize, oh my, it isn’t a To Kill a Mockingbird clone, are cheating themselves of a good story. And bookstores that encourage readers to return copies of this novel that deserves to be read by Lee fans, even if it challenges their expectations (and could’ve used some editing here and there), ought to know better than to be complicit in readers’ ignorance. Read Go Set a Watchman for yourself. If you appreciate it as Harper Lee’s initial experience in novel-writing, that’s great — I think you should. If you don’t, well, that’s the risk you always take with a new book. Since when did people have the right to return books just because they didn’t like them? READ MORE: “A Personal Take on Go Set a Watchman,” by Ursula K. LeGuin. I disagree with your opinion. If I lived near the brave bookseller in your article, I would support him and shop there regularly because I admire him for his decision. I might even buy GSAW, hate it, and not return it! He made a bold marketing move. I applaud him. Also, just because an author once wrote a great book doesn’t mean I have to love everything they’ve written, especially their rejected first drafts. I agree with you whole-heartedly. How anybody didn’t know exactly what Watchman was meant to be is beyond me. It was everywhere, in the press, in articles about the finding and publishing of the book, and in the marketing. Even a quick online search, or alternatively a chat with booksellers, could have told any customer that. Unless you’re a bookshop who is offering the most anticipated book of the year without actually doing any necessary research into what that book is. I’m looking at you, Brilliant Books. While I tend to research most books I buy before doing so, I’ll occasionally pick up a book impulsively without knowing anything about it. I don’t always like these books. That doesn’t mean I’ve been bamboozled by marketing, it means I had different expectations. I’d never expect a refund for a book unless it was some anomaly such as a printing error. People need to take responsibility for their own purchases – if they were expecting another Mockingbird they deserve to have ‘wasted’ their money because it was obviously not Mockingbird #2, and they need to be a bit more open minded and read it. I personally thought it enriched my understanding of To Kill a Mockingbird, and will surely make for a more informed experience of it the next time I pick it up. I’m really glad Watchman was published and I know I’m not the only one. Have come to the conclusion that Mr. Makin offered the refund as part of a publicity ploy. It is fascinating to google his name: there are now pages and pages of stories about his refund offer.